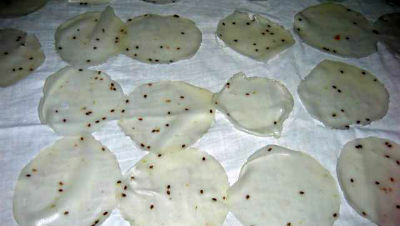 Vathal or Vattal is a sun-dried vegetable which can be stored for over a year. They are deep fried and served as an accompaniment along with rice and rasam or sambar. They are also used in some gravy preparations instead of vegetables. When one is hard pressed for time or when one wants to have a light meal, vadams are served with rice and rasam or sambar, cutting out the preparation of making some vegetable curry. Like papads in the north, appalams are very popular in the south, especially in Tamil Nadu and Karnataka. They are served at meals, specially on festive occasions. They can also be served at tea-time as snacks. We have 15 Vadam and Vathal recipes in this category. Here are the most popular Vadam and Vathal recipes from Awesome Cuisine ever.